Walnut Village is located in the heart of Anaheim just a few blocks away from Disneyland, Angel Stadium, the Anaheim Convention Center and the Honda Center. 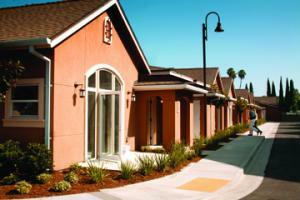 It is a walkable, 12-acre, gated community with on-site security. Residents 62 and older are surrounded by people, amenities and events that make life engaging. Its award-winning design is set apart by its unique village approach in which a village square offers residents opportunities to dine, engage in social activities or simply relax. It offers private residences, a Fitness & Aquatics Center, Lifelong Learning Center and a Performing Arts Center. Walnut Village is a Continuing Care Retirement Community offering four levels of care: Independent Living, Assisted Living, Skilled Nursing Facility and a Memory Support Neighborhood. Also located at Walnut Village is Walnut Manor for those requiring 24-hour skilled nursing services, rehabilitation therapies, post-surgical care and extensive wound care.